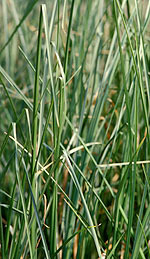 Vetiver, a tall tufted perennial grass with long narrow green leaves, has been used for centuries in Tahiti, India, Java, and Haiti to make awnings, blinds, and sunscreens. In Java the roots of the vetiver plant are woven into mats as well as thatching for huts, and this gives the rooms a fresh fragrant smell, which insects strongly dislike and avoid. Growing the tall grass protects the soil from erosion, and the plant is also a popular ingredient in perfume, soap, and toiletries in these countries. The vetiver essential oil extracted from the root contains vetiverol, furfurol, a-vetivone, b-vetivone, benzoic acid, vetivenyl vetivenate and vetivene, which give the essential oil nervine, sedative, tonic, antiseptic, vulnerary, aphrodisiac, and cicatrisant properties. The Chinese assert that vetiver oil has calm, moist energy that enters the cells in the brain and intermingles with the energetic heat that accumulates from anger and vindictive thoughts, cooling and calming the consciousness. Vetiver oil grounds and stabilizes emotions that develop from a hyperactive mind as well as an insecure self. Vetiver oil also has the ability to rejuvenate dry skin. In Ayurvedic medicine, vetiver oil is used to alleviate heatstroke, fevers, and headaches, as well as to alleviate thirst. The oil has been used for centuries in India to relieve skin and joint disorders and to reduce inflammation. The oil has been used for decades to ease the pain of arthritis and to clear up eczema. Modern research discovered why vetiver oil has such a powerful effect on the skin and emotions. The aromatherapy oil stimulates the endocrine glands, helps boost a weak immune system, and lowers the heart rate when an emotional response is triggered. The oil helps the cardio-respiratory system reach a calmer state because it interacts with hormones like estrogen and progesterone. Vetiver oil can help reduce anxiety and depression, and it has the ability to get rid of acne when used in cream or lotion form. When the oil is massaged into the skin or diluted in a bath, physical exhaustion, insomnia, and arthritic pain lessen. When the vapor is inhaled, nervous complaints and hysterical tendencies seem to evaporate like steam. Vetiver oil is commonly used to treat dry, irritated skin in aromatherapy. The oil can be blended with other essential oils such as jasmine, lavender, and ylang-ylang to enhance results, and to increase the effectiveness of the oil on the skin. This entry was posted in Essential Oils and tagged dry skin essential oil on May 13, 2010 by Keith Cleversley.